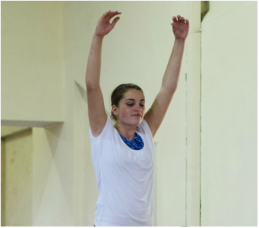 Gymnastics is a fun sport for everyone! The AAG have recreational classes for all ages and skill levels based on Artistic Gymnastics and Tumbling, with opportunities to progress to competitive classes. Children undergo an assessment period close to the end of each term to determine their level of achievement. This process also assists in identifying when a child is competent, and can perform the set skills required of them for that program safely enough to move up to the next grade, level, or into another program i.e. our development squads or a competitive program. This program offers opportunities for strength building and skill development in specific gymnastic apparatus. Women’s Artistic Gymnastics use Beam, Vault, Uneven bars and the Floor. Men’s Artistic gymnastics use the Pommel Horse, Rings, Parallel Bars, High Bar, Vault and the Floor. Classes provide opportunities for gymnasts showing promise and commitment to be offered positions in the development squad or competitive class. This class is for all ability levels and is aimed at building strength and developing skills utilised in tumbling and aerial work specifically. Floor work includes handstands, cartwheels, round offs, back flips and other ‘tricks’ commonly used in dance and other performance disciplines. This class can be attended in addition to other recreational classes or as a singular weekly gymnastics session. This program offers teenagers aged 13 years and older opportunities to develop gymnastic skills on each apparatus. Students complete structured warm up, body conditioning and strengthening sessions, apparatus skill development, and a controlled cool down. Students set personal goals and work to improve targeted gymnastics skills - anything from forward rolls to back somersaults, swings to walk overs - at their own pace. What should my child wear to classes? Gymnastics students should wear comfortable sports clothes. All students should bring water in a plastic water bottle and socks to wear on the trampoline. Do I need to supervise my child during lessons? If your child is confident and independent he/she may be left in the care of the instructors during the lesson. Parents may stay in the foyer during lesson times if they wish. 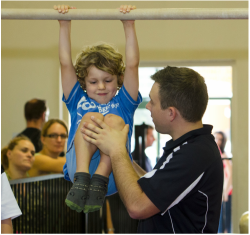 How old does my child need to be to start Recreational Gymnastics? 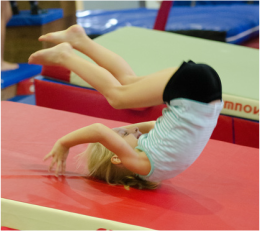 Recreational Gymnastics lessons are appropriate for school aged children ages 6 and above. Kindy Gym options are available for younger children. Click here to find out more about Kindy Gym. For more information, see the front desk, or call (02) 9759 2017. Refund Policy: Unfortunately we are unable to give refunds for our classes, nor transfer fees to siblings, relatives or friends. Deferral of fees will be considered in extreme circumstances only and on a case-by-case basis. For a number of reasons, Australian Academy of Gymnastics will no longer be able to accommodate make up lessons for classes in 2019. In the event of illness/injury beyond two weeks per term, deferrals will be considered on a case-by-case basis with an accompanying doctors certificate.